In his recent historic speech before the South African Parliament, the Prime Minister of Great Britain, Mr. Harold Macmillan, spoke of the "wind of change" blowing over the continent of Africa; indeed, this 'wind of change' is blowing over all territories inhabited by dependent peoples. This wind has brought to the West Indies and to B.G. the quickening draught of political awakening which manifests itself in the fact that these territories are urgently seeking political autonomy and full independence. Jamaica has internal self-government, and on August 16th, the West Indies Federation as a whole became self-governing, the British government still controlling its foreign policy and defence. We in B.G. still have some time to wait. The new constitution we obtained earlier this year, when the political delegation went to the Colonial office, comes into effect in August 1961, at which time talks will be held at the same rendezvous concerning our independence. This period of marking time, as it were, is really a blow to the pride of many Guianese, who when they distinguish themselves abroad in the spheres of higher education, have to return to the land of their birth as servants, and not as their own masters. It is small wonder, therefore, that many of our illustrious sons of the soil seek employment abroad, where, even though they are not their own masters, they are satisfied because they receive larger salaries and better working conditions. Thus the fact that we are not independent robs us of many of our brilliant sons, of whose help we are in dire need, for the progress of our country. It shocks our pride even more to know that our West Indian counterparts who are in no way our superiors and in some ways are our inferiors (at the recent U. C.W.I, scholarship examinations, B.G. won four of the six open scholarships) are achieving the goal of independence long before us. To retrieve our wounded pride and to cause our illustrious brothers to return, we must continue to agitate strongly for our independence. Our brilliant sons must be given something tangible in return for their self-inflicted nostalgia — and that must be their independence. We, the present generation of Q.C., will soon be holding the reins of our government, and we should be so well equipped academically, politically, and economically, that our independence cannot be denied us. Let us therefore adopt a responsible attitude from now, so that when we shall have laid the foundations of an independent and prosperous Guianese nation, we can say like Horace, "Exegi monumentum aere perennius" 'I have built a monument more lasting than bronze. STANDING (L TO r): Messrs. J.A. Rodway, M.T. Lowe, C.W. Lall, C.L. Drayton, R.J. Moore, J.N. Chung, R.C.G. Potter, C.A. Yansen, B.A. Eyre, R.D. Rock, B. Hinds, E.R. Burrowes, Chunilall, S.M.D. Insanally, E.A. Wason, R.E. Jackson, E.W. London and C.P. Yhap. ABSENT: Messrs: J.J. Niles, R.A. Lee, E.A. Whittaker, E.P. Clayton, K.A.L Brown, C.I. Trotz, and N. Howe. BACK ROW (L to R): T.O. Holder, T.C. Edwards, G.F. Rampersaud, D.G.F. Rohlehr, J.W.M. lashley, L Houston, R.B. Diyaljee, H.S. Birkett. MIDDLE ROW (L to R) F.A. Gumbs, G.H. Rickford, M.Y. Khan, D.W. Scott, W.A. Rodney, A.O. Thompson, W.F. McGowan, H.A. Niamatali. FRONT ROW (L to R) W.H. Bacchus, J.T. Seymour, R.M.S. Khan (Head of School), Mr. N.E. Cameron (principal Acting), L.A. Robinson (deputy Head of School), H.A.D. Chesney, E.A.C. Thomas. BACCHUS, W. H. (1952—60)—1952—Govt. County Scholarship. 1957 G.C.E. Ordinary Level. 1958 School Prefect; School Football Captain; Football colours. Vice capt. Athletics; Sports Editor of Lictor and Magazine. Deputy Head of Percival House 1959—Head of Percival House. Sports Editor of Lictor. 1960— Advanced Level. BIRKETT, H. S. (1952—60)—1957 G.C.E. Ordinary Level; 1958—School Cricket XI; School Prefect; President Photographic Society; 1959—Advanced Level; Head of Durban House; Secretary Photographic Society; Cricket Colours; 1960—Advanced Level. CHESNEY, H. A. D. (1951—60) 1957—G.C.E. Ordinary Level. Junior Athletic Champion 1958—Business Manager Magazine; Committee Member Co-op Society. 1959 captain of Athletics, vice Captain of Volley ball; President of Tour Club, School Prefect, Head of Weston House 1960—Advanced Level. HOLDER, G. B. (1952—60) 1952. Govt. County Scholarship 1957 G.C.E. O'Level;Senior School Scholarship, School Certificate prize; 1958. 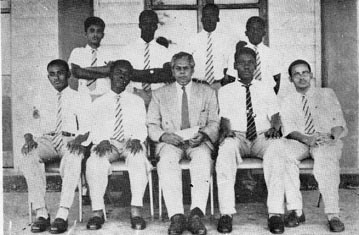 1959 School prefect Head of Pilgrim House; G.C.E. A'Level Treasurer of Science Society; Vice Captain of Hockey; C.S.M. Cadet Corps. Troop Leader Scouts. 1960 Advanced Level. HOLDER, T. O. (1952—60) 1952 Centenary Exhibition. 1957 G.C.E. O'Level 1958 School Table Tennis Team. 1959. School Prefect; Deputy Head of Moulder House; School Football and Volley ball teams; Table Tennis Colour* 196^; School Athletic Team; Athletics Colours; Runner up in School Table Tennis championship; Advanced Level. INSANALLY, V. C. (1953—60) 1953. Coronation Scholar. 1957. G.C.E. Ordinary Level, 1956 Alliance Francaise Junior School prize. 1958 Assistant Editor of Lictor. 1959 Yice president Inter School Christian Fellowship; President Q.C. Dramatic Society. 1960 Advanced Level. KHAN, R. M. S. (1951—60) 1954—Q.C. Middle School Scholar. 1957 G.C.E. Ordinary Level; Moulder Cup for Junior Cricket; School Cricket Colours. 1958. School Cricket Captain. School prefect; Deputy head of Pilgrim House. 1959. Advanced Level. Head of School. I960. Advanced Level. KUNAR, L. S. (1950—60) 1956. 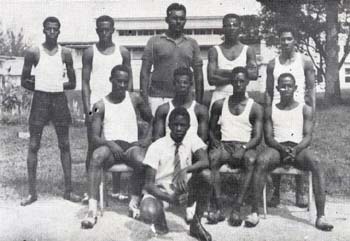 Athletic Champion Nobbs House 1958—G.C.E. Ordinary Level. Senior School Scholarship, General Certificate prize. 1959. Advanced Level (distinction in Pure with Applied Maths) 1960. School prefect; Deputy Head of Nobbs House. Advanced Level. B.G. Exhibition to U.C.W.I. LASHLEY, J. W. M. (1953—60) 1953 Police Scholarship. 1956 School Hockey team. 1958—G.C.E. O'Level. L/cpl Cadet Corps. Magazine staff; School foot- ball team. 1959. School prefect. Head of Woolley House; School athletic and Volley ball teams; Secretary of Educational Tour Club, Seargent Cadet Corps. 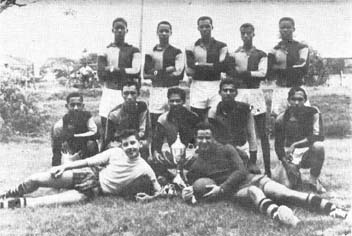 1960—School Football Colours. McGOWAN W. F. (1952—60) 1958—G.C.E. Ordinary Level. Secretary of Table Tennis; Member of cricket 2nd XI; runner up in school Table Tennis Champion- ship; School Table Tennis team. 1959 School Prefect, Deputy Head of Percival House; vice Captain Table Tennis; Table Tennis Colours; Captain of Wight and Rajah Cup Cricket XI's 1960. Advanced Level. RICKFORD, G. H. (1953—60) 1953. Government County Scholar; 1958: G.C.E. Ordinary Level; Secretary Historical Society; Junior Librarian 1959. Treasurer. Beekeeping Society; Business Manager; "Lictor", Secretary Literary and Debating Society; Troup Leader (9th G'Town) Senior Art Prize 1960. Assistant Scout Master; School prefect. Advanced Level. RODNEY, W. A. (1953—60) 1953 Centenary Exhibition 1955 Q.C. Middle School Scholarship; 1958 G.C.E. 0' Level; President Historical Society, Vice-President Debating Society Editor Magazine; Editor Lictor Vice president Tour Club, School Athletics, 1959. L/cpl Cadet Corps, Advanced Level, School Prefect, Deputy Head Cunningham House. 1960—School Colours (Debating) Advanced Level U.C.W.I. Open Scholarship. Luckhoo Memorial Prize ; (Debating) Wishart Memorial Prize (English). ROBINSON, L. A. (1951—60) 1951. Government County Scholarship 1956. G.C.E. Ordinary Level. 1958 School Hockey Team; Senior Patrol Leader Scouts; L/Cpl. Cadet Corps; Medal for Shooting; School Prefect; Head of Austin House. 1959—Secretary Science Society; President Radio Club; Deputy Head of School; Cpl. Cadet Corps. Advanced Level. 1960. C.Q.M.S. Cadet Corps; Advanced Level. THOMAS, E. A. C. (1953—60) 1953—Government County Scholarship. 1958 G.C.E. Ordinary Level; Senior School Scholarship 1959. Vice President Co-op Society; L/Cpl. Cadet Corps. Advanced Level (Distinction in Pure with Applied Mathematics); Head of Cunningham House; School Prefect. 1960—Advanced Level; U.C.W.I. Open Scholarship. WILSON, W. A. (1952—60) 1952—Government County Scholarship. 1957 G.C.E. Ordinary Level; 1959—G.C.E. Advanced Level (Distinction in Botany); "School Prefect; President of Science Society. 1960 G.C.E. Advanced Level. Gumbs, F. A. Harding, R. A.
Hariram, P. Hentzen, D. R.
Moore, G. E. Ng-See-Quan, W. E.
Mr B. O. Adams, on his recent appointment as a Queen’s Council. Mr. W. Chin, on obtaining his M.B.B.S. from U.C.W.I. Mr. C. A. John, on obtaining his B.Sc. (Edin.). Mr. R. M. Isaacs, on being awarded a one year Bursary to France, by U.C.W.I. 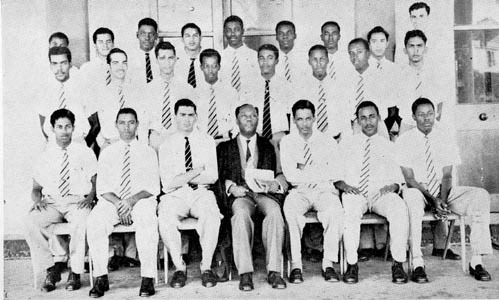 Mr. N. A. Robinson, on winning a 1959 Guiana Scholarship. Standing: - E.M. Griffith, H.B. Sheppard, B.L.A. Dummett, T.O. Holder, J.W.M. Lashley. Centre: - W. Lewis, R.B. Diyaljee, W.H. BacchuS (Capt. ), J.R.G. Ramprashad (V.capt. ), R.I. Zitman. Standing: - T.O. Holder, L. Houston, J.M.C. Singh, J.W.M. Lashley, W.H. Bacchus. Centre: - H.A.D. Chesney (Capt. ), C.H. Hope (V. Capt. ), E.G. Newport, R.E. Grant. Absent: C. Spence, and E.I.J. Fields.